After the cancelation of the opening round, the 2018 championship eventually got up & running at Bishopscourt on the 7th April. However it wasn’t without the weather intervening again, as early morning fog delayed the start of racing & eventually resulted in the Pre Finals being cancelled. When racing got under, the good entry provided some great racing across all classes. In the Bambino class it was Ben Smith that continued his good start to the season with overall victory. In Honda Cadet Gavin Dewart set down a marker for the rest of the year, as he looks to improve on his runners up position in 2017. While in IAME Cadet Kalum Graffin was totally dominated. Having moved up from cadets Zach Rodgers was rarely headed all day in Mini Max, as he took a clean sweep of wins. 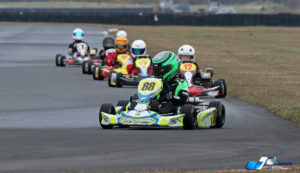 In Junior Max it was the reigning Mini Max champion, Max Allen who came on the top spot of what is set to be a competitive class. Senior Max was the domain of Conor McPolin, taking early championship lead with 3 wins. Despite the best efforts of the early morning fog, the 2018 championship got off to the best possible start, with one of the largest 125 grids for many years. The final results show 3 wins for James O’Keefe in SK125 & Stuart Coey in SK 250. This didn’t tell the whole story, with some fast, close racing at the front of both classes, which sets the tone for what should be a competitive season ahead. 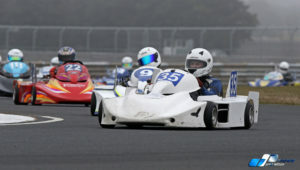 Superkart results can be found HERE.